On Saturday, 14th May this year, ADAMED SmartUP took part in the Warsaw University of Technology Educational Picnic. The classes entitled “Glass and eye” were conducted by Dariusz Aksamit – one of the scientists from the programme. Hundreds of young visitors discovered with bated breath that science is a wonderful adventure and the only thing you need for it is an internal curiosity about the world. On this year’s picnic, held under the name “Od mikro do makro” (From Micro to Macro), large interest was aroused by a blue light fluorescence microscope used for observing human skin, which was available on the ADAMED SmartUP stand. For many students observing their own body under a magnifying glass, i.e. their own exfoliating epidermis, was a truly scientific experience. As there was a possibility to make a colourful print, many visitors came back home with a souvenir from ADAMED SmartUP. All doubts were explained to the youth by Dariusz Aksamit, a PhD student at the Department of Physics at the Warsaw University of Technology and a lecturer of ADAMED SmartUP. His large experience in popularising science enabled him to give clear answers to even the most difficult questions asked by the youth. There were plenty of questions because also other things than skin could be viewed under the microscope – among others, security features on banknotes and a mobile phone screen enlarged 400 times. The instructor explained the difference between the RGB and CMYK colour models on this example. The youngYoung people’s enthusiasm was intensified by other attractions offered at the stand – balloons filled with helium, colouring books and ADAMED SmartUP gadgets. 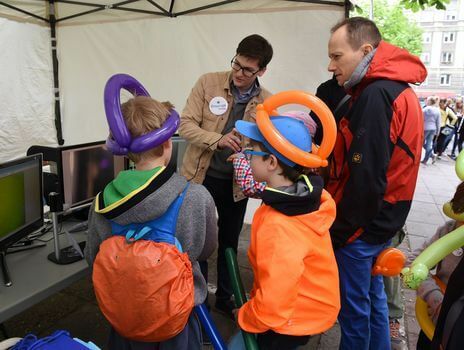 The organisers of the picnic did not forget about amusement for the youngest scientists and prepared, among others, a scientific playground, a slide and a Lego workshop. The majority of the attractions combined fun with learning – the youngsters could, among other things, explore the laws which rule the world, learn what electricity is, how the universe was created and how to protect nature. Student scientific societies of the Warsaw University of Technology held interactive shows. The students presented their best projects and inventions. The older participants could also take part in many interesting lectures and talks on exact science. Of particular interest were the presentations on the influence of nanotechnology on cosmetics, or lectures about surprising applications of physics. The ADAMED SmartUP stand neighboured the one of the Stanisław Staszic High School No. 14 in Warsaw, which was managed by Maksymilian Głowacki, the winner of the grand prize in the 1st edition of the programme. The organisers estimate that about 3,000 people visited the picnic. The Science Picnic “Od mikro do makro” (From Micro to Macro) was held under the auspices of the President of Warsaw and the Masovia Voivodship Department of Education.